If you are missing one or more teeth, then you know that the consequences can be annoying at best and debilitating at worst. You may be reluctant to speak up or smile, because you know people will notice. Eating a healthy diet may be a concern, because you are unable to chew certain foods, such as fresh fruits and vegetables. With time, the need to replace missing teeth becomes all the more imperative. For Aledo residents, the drive to Weatherford, TX, is worthwhile for lifelike dental implants from Cosmetic & Family Dentistry. Regardless of the reason, our dentists are primarily interested in restoring your smile and your good oral health. And while there are other options for tooth replacement, such as a fixed bridge or dentures, nothing is as “real” as a dental implant. 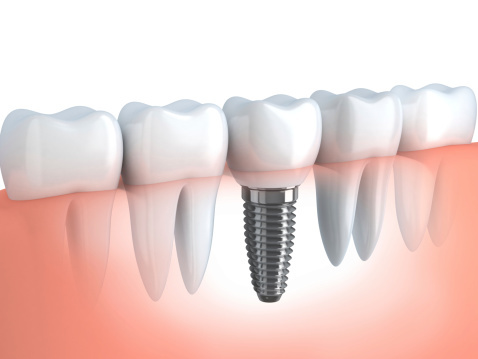 Dental implants not only replace the crown of a missing tooth, but the root as well. Thus, implants are strong and stable, thereby allowing people to speak and chew with confidence. And implants have the added advantage of stimulating the jawbone, so bone loss and facial sagging are prevented. The implant procedure begins with minor surgery, in which the dentist positions a titanium post in the bone beneath the open socket of your missing tooth. Through a process called osseointegration, the post fuses with the surrounding bone tissue. This process requires a few months during which you’ll wear a temporary crown. When you’ve completely healed, you’ll return to Cosmetic & Family Dentistry to receive your permanent crown. With daily brushing and flossing, and regular checkups with Dr. Romack or Dr. Mulkey, your dental implant can last a lifetime. If you would like to learn more about dental implants, then call Cosmetic & Family Dentistry in Weatherford, TX. We also serve patients from Aledo, as well as the surrounding areas of Brock, Millsap, Springtown, Mineral Wells, and beyond.